My grandma passed away on Christmas just a few short days ago. Her passing has reminded me how each one of us grieves differently: some folks wail, some cry, some go silent, some get busy, some to work, some to bed, some fast, some overeat, and some of us do a little of each of these things or even something altogether different. Grief is expressed differently for each of us and the way we grieve often changes over time. Grief is as unique and special as we are… and as the relationships we share. The important thing is not how we grieve but that we allow ourselves to grieve… no matter what form our grief takes! As long as we are gentle and loving to ourselves during this special time, that is what is important. We need time to grieve… time to reflect and to feel. Time to absorb the meaning that person has in our lives. To appreciate how their presence in our life holds special meaning. We need time to dwell in the love we share with our departed loved one. We need to allow ourself the sacred gift of grief. This time of grief is a sacred time. 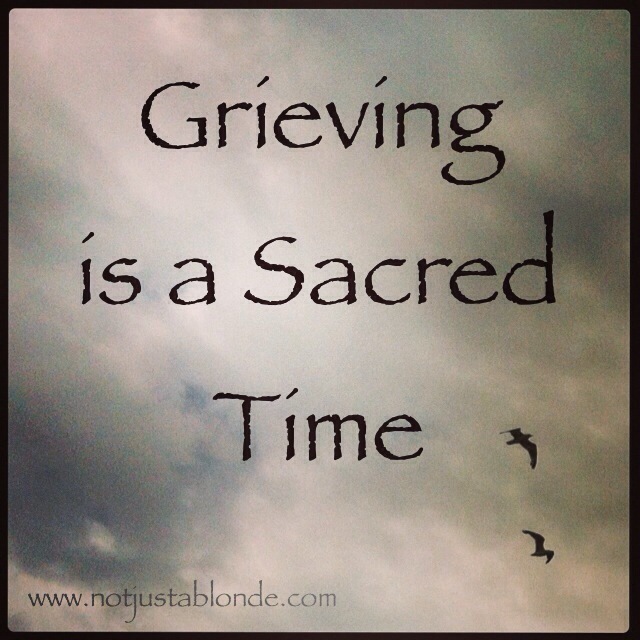 Grief deserves a sacred space in our over-scheduled, highly-demanding lives. The time to grieve is a gift we must give ourselves to heal our hearts, integrate the imprints that our loved one’s souls have left on our hearts and in our lives as we carry on. Grief is not something to fear but to embrace. It must have it’s time to provide for us it’s holy purpose. Grief is a sacred gift of healing and love. Well said, Blonde. I agree with your assessment. I lost both my Dad and a younger sister this year. They were the first deaths in my nuclear family. I experienced grief as I have not since my grandfather died in 1975. Hugs back. I am glad your supervisor told you to go… that was wisdom. You needed that driving time… that was a true gift. My boss asked me if I wanted to go home (I was off work on the 26th, this was the next day) but I had 15 patients on my caseload and just felt the need to carry on. I am glad though to have the next few days off… I need that time. Grieving is an important part of living. I am also not a “typical” griever either (whatever THAT is) and have felt some guilt over not ‘losing’ it like others seem to do. I’ve questioned: Do I not care as much? The answer, of course is: No! I absolutely DO care, and grieve and love but I heal, grieve and process differently and THAT IS OKAY! One cannot embrace grieve if one is worried they aren’t “doing it right!” or are beating themselves up over their methods. Thank you for sharing your sweet memories of your grandma! Those are the little treasures given when we take the time to reflect and mourn in our own time. My heart is smiling with you! As always your comments make my heart smile as well! I’m not a typical anything. Lol I remember my first job after college was in a brand new warehouse for Office Depot. I was in on the ground floor, so to speak, and one day my supervisor asked if I was excited about the opening. I was, but because I wasn’t bouncing up and down in excitement, she thought there was something wrong. Well said, oh Wise One. I never thought of grief as a gift, but that is a great idea. Thank you for sharing your gift with us in this post. May your thoughts and memories of your grandmother bring you comfort in this difficult time. So sorry for the loss of your grandma, Ann. This was a very timely piece for me. Had way more than my share of good friends including my father-in-law die this year. (total of 5 I think) Thought it might be done for the year and just lost another dear friend yesterday to cancer. Trying like crazy to turn the hurt into something good, but your’e right – it’s a process. Watching my peer group (middle age) start to drop off is both painful and a real eye opener. Makes you appreciate your life in a way that nothing else does.